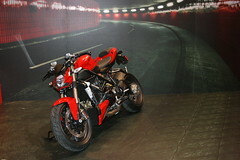 The much desirable 2010 Ducati Streetfighter S. This bike was on display at the 2010 Cycle World International Motorcycle Show. I’m still not sure if I like this more than the Monster, but if you’d like to donate either one to the Make-a-Chris Foundation I certainly won’t be picky. Seriously, for a mere $18,995 you could make me very happy. I’ll totally be your best friend and you can even come to my birthday party. Sleepover! This entry was posted on Saturday, January 23rd, 2010 at 12:50 pm	and is filed under Motorcycle, Photography. You can follow any responses to this entry through the RSS 2.0 feed. You can leave a response, or trackback from your own site.